Wildwood has been needing a new paint job for about the last five years. We have been nursing it along by filling and patching up bits here and there, but ultimately that made her look like she had bright white shiny spots over the dull hull. As it is her 30th birthday next year, I decided it was time to spend the money and give her a new look! 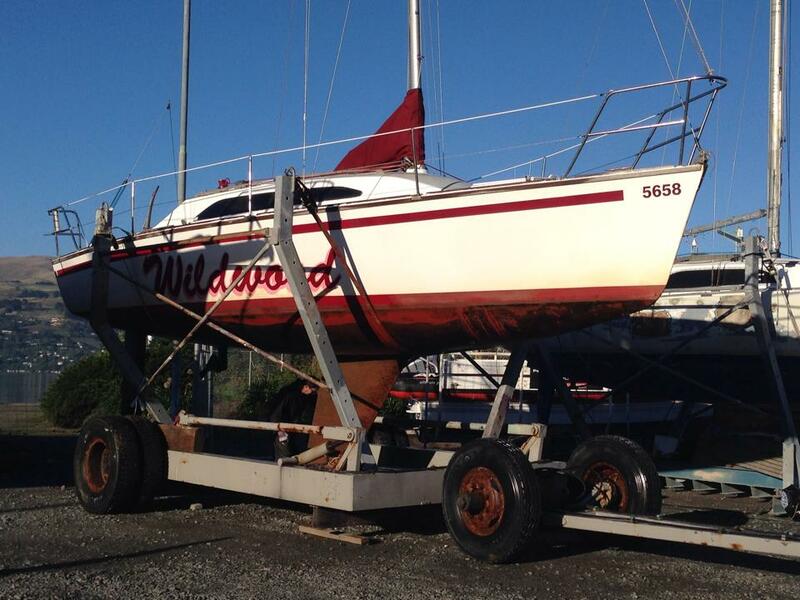 I had read about a company called Boat Coat in Auckland who wrap boats in a vinyl wrap – http://www.vinylboatwrap.co.nz I liked the idea of this as our local haul out yard is a dusty exposed place – it is either too cold or too windy to paint and guarantee a nice finish. With the boat wrap you can get a perfect finish and as the colours don’t fade, it means that you can easily patch any bits that need to be repaired. It has an expected life span of seven years too. You can choose from a huge selection of colours and prints, or get your own design printed on to the vinyl to be applied. When I was searching the internet for inspiration I saw yachts with carbon look print, stamped steel, and speedboats that looked like they had been spray painted with graffiti art. The sky is the limit in terms of the design. I wanted something different, but still wanted to retain Wildwood’s personality and red theme. So I had been in touch with Helen and Dan from Boat Coat and got a quote. 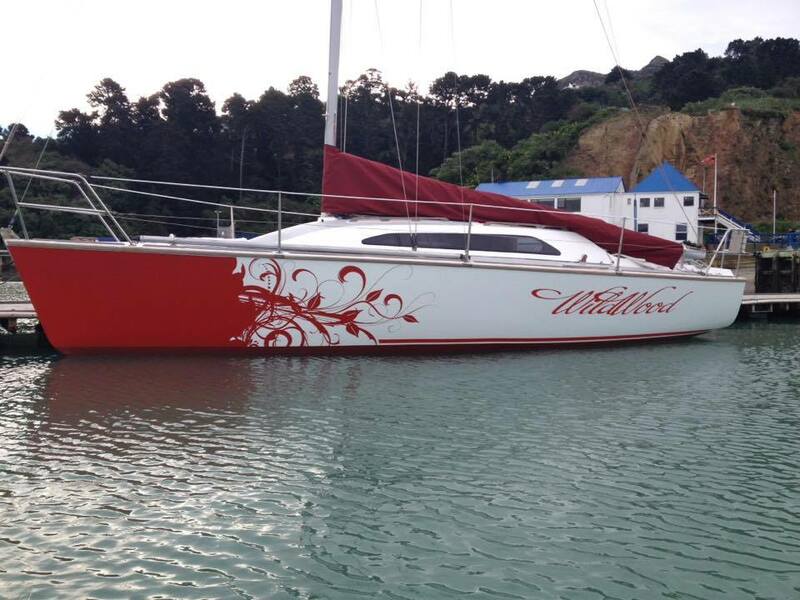 The base price for an all gloss white finish was around NZD$3000.00 using 3M wrap. On top of that I added the red design and graphics at the front, a red stripe, the name graphics and the design. The total cost came to around NZD$5000.00 including GST. This is compared to around $6000 for a new paint job. To get the job done we needed to prepare the hull to have a nice smooth surface for the graphics to go over. As with a paint job, the quality of the end result is all in the preparation, so we hauled her out three weeks before Dan & Helen were due to arrive to give us time to get everything done at the weekends. Here she is on haul out day. We spent two weekends sanding the hull and filling any cracks and chips in the old paint work and removing the old name sticker – this took a lot longer than we had anticipated (use a heat gun) and we managed to scrape a bit of paint off during the process. Thankfully my lovely crew members came along and helped out which made life a lot easier! So we sanded and filled, and scraped and sanded and filled again. Every time I looked at the hull I saw another bit that needed filling… and then sanding…. Then along came Dan and Helen and they started wrapping in the freezing cold winter of the Naval Point Haulout yard. It took them a few days to get it all sorted, and luckily they had some time up their sleeve and were staying with Dan’s family in Christchurch as the weather was a bit unpredictable. But thankfully they had some nice calm days to get it all done. Yesterday they finished and here is the finished result! I am so excited about it, and Helen has said that the pictures she has put on Facebook have had over 4000 views! The comments we have had have been fantastic! I am glad I chose this design. We are also going to add her sail number in white on the red bow in the same font as the name graphic. I am sure she will stand out on the water! Wow – really impressed with the cost. Seems like really good value and it looks amazing! Amazing update to her look! I love it!